Do you think is easy to be an entrepreneur? Let me tell you the truth! Its lots of hard work, sweat and tears perhaps. Plus be prepared to do everything yourself - “one leg kick” is a norm in the beginning. In every business profit is your ultimate goal and also your survival so how do you know that you’re earning or not? So a proper financial report is important for you manage and analyze your cash flow and taxation purposes. You can’t be guessing or just estimating because this involves money and survival. For those who needs the cash flow to pay bills and income to support their family this is even more important. 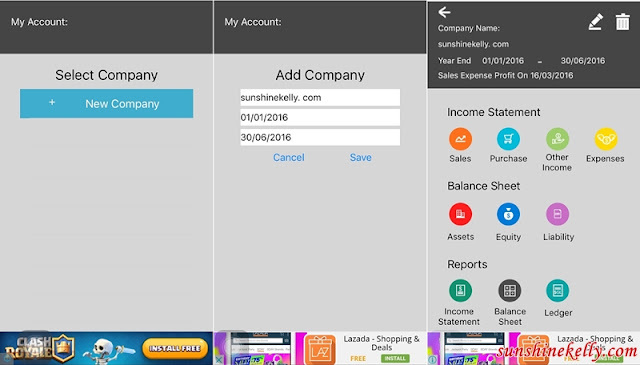 In the nutshell, Easy Count Apps is easy to use and understand accounting on your smart devices. Even you don’t have accounting basic you will still be able to use it. It helps the small business size business entrepreneurs that can’t afford accountant such as online sellers, night market, small retailers & etc. Now you can manage your business account anywhere, anytime using Easy Count. Let’s start, key in your company and the accounting period. As you can see from the app you can also manage a few business accounts. For example you have a blog shop, a food outlet plus you are freelance writer, you can create more than 3 companies account by using Easy Count Apps. In the main page there are 3 categories – Income Statement, Balance Sheet and Reports. The Income Statement consists of Sales, Purchase, Expenses and Other Income. When you click into each segment you can choose either Cash/Bank or Credit, for example Sales you can have cash sale or credit sales. 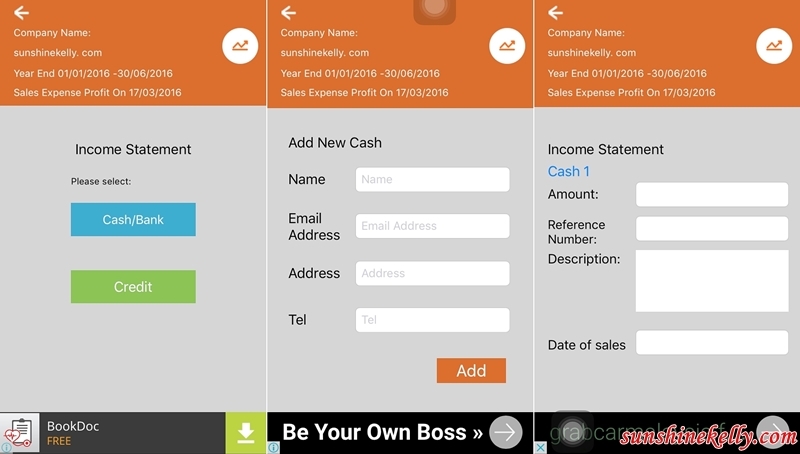 If you choose cash/back then you have to label client’s name for example Cash 1 and key in the details such as name, email, address and telephone. Then go back, chose Cash 1 and key-in the amount, reference number, description and also date of sales. Once it’s done click submit. One transaction is completed. Do the same for others such as purchase, expenses and other income. The same also apply to the Balance Sheet category where you have Assets, Equity and Liability. It’s only the initial part you need to key in the label, your clients, supplier, debtors, creditors and category details. The repeat transactions will be much easier and faster. Once you have key in all the data then you can generate the reports anytime you need it or want to have an overview of it. The basic are the Profit & Lost, Balance Sheet and Ledger. Easy Count is an easy to understand, intelligent and hassle-free application for entrepreneurs and small business to record and manage their business accounts easily and efficiently. This application able to track your company sales records, purchase records, expenses, assets, equity, liability and other incomes. All you need is to learn and get familiarize with the basic accounting, which is fast and then you can save money on hiring accountants to get the job done and also you don’t have to buy the accounting software. In the process of doing so, eventually you have a clearer picture of your financial situation and your cash flow. This will help you to manage your business more efficiently. Even if you are out of the country, you still able to keep an eye on your business account. 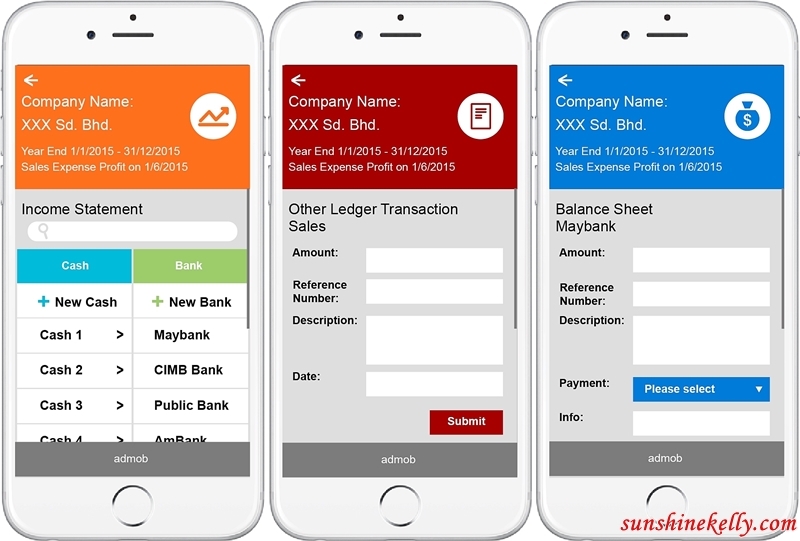 Now you can manage your business account anywhere, anytime because it on your mobile. I know we are busy and tend forget sometime but with Easy Count Apps on our smartphone we can enter the purchases, sales, expenses or other income immediately when the transaction is done or when we receive the statements or bills. This is to avoid double work, mismanagement or missing out the entry. Therefore, your company financial report will be up to date and accurate. 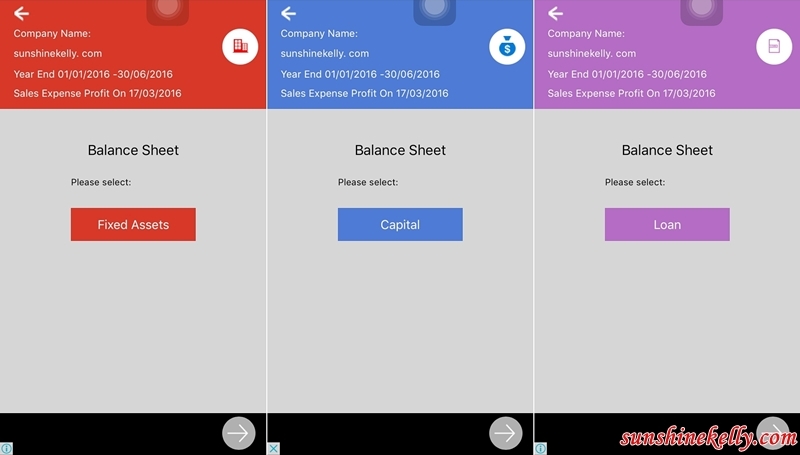 Easy Count Apps is an simplified accounting apps developed by App Quest and it’s now available on Google Play and App Store. Download the app and start to be your own accountant for your business. What a coincidence! I was looking for such an app and I saw that you have done a post about it. Looks pretty effecient. Thanks for sharing this! Hey Sunshine! Thanks for creating this valuable piece. Definitely it will empower people on the go!! Wow! Sure is an awesome app. Isn't it amazing that we literally can control and keep track of our lives with only our phones? I will definitely download this app. My online business and various investments can use this. Thank you for sharing. I actually never thought of looking or doing research about such an app. I appreciate you. Keep it up! I still depend on pen and paper currently. This is a handy app to have. Time to upgrade. Hey, there's an app for that! ha! :) Thank goodness too, my accounting skills are not always so amazing. Now there are Apps for everything! Amazing to see how accounting and finance is made so easy using this app. That's awesome. I really am impressed with all these productivity apps coming out especially the ones that would help me with keeping track of income and the like. everything in one mobile app! such a brilliant app ! Wow, this seems to be a one step ahead with accounts and finance now on app. I'm a Certified Public Accountant and this sure beats the regular number crunching. It's made even easier for those with no accounting background. I love to use this app, but my mobile SD card is already full. Hmmm..need to look for another gadget to try. I guess this is country-specific since each country have their own tax calculation schemes? For sensitive documents like an income-tax form though, I prefer having my accountant do this job for me. I can definitely use one of these apps! With tax time right around the corner I have a lot to learn. Soon we dont need accountants liao haha, everyone is loosing jobs to technology as a replacement. Very great apps to help us out with accounting stuff.. Easy to use also! There is nice source of information. You can take help with accounting homework . It helps you in every kind of matter of accountant. It is very easy to use.